Higgins was quizzed on the finances of the office of the President. INCUMBENT PRESIDENT MICHAEL D Higgins has taken part in his first television interview of the presidential election campaign. 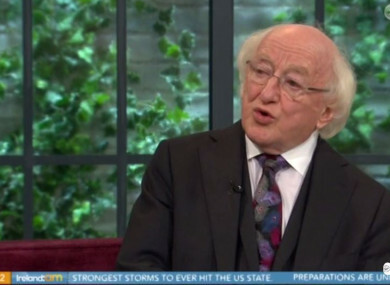 Appearing on Virgin Media One’s Ireland AM this morning, Higgins was quizzed on the finances of the office of the President. He reiterated that he will return the balance in the Áras account at the end of his presidency. There has been recent scrutiny around the finances of the office of the President, particularly after it emerged that there is a €317,000 annual allowance which has no State oversight. At the launch of his campaign at the end of last month, Higgins said he had no issues with transparency with regard to his expenses. He pointed out that the €317,000 fund had been in place since 1938 and said it was used for entertainment such as tea parties, events like Bloomsday and those commemorating the victims of the Magdalene Laundries. He again noted this during his interview this morning. “What I can absolutely say is that everything was spent in accordance with the 1938 Act,” he siad. First of all, I think you should be very, very clear about this. At the end of a presidential period anything unspent goes back to the exchequer. He added that it is important to realise how important visits to the Áras are for citizens. “Can you possibly imagine what it meant to the Magdalenes to come up and as they walked and be treated with respect,” Higgins said. “There’s such a wide range of Irish society that come. There are people who are donors, there are people in the arts community, there are people in the musical association,” he continued. Higgins stated that none of the money spent during the time of his presidency was spent at a personal capacity. I’m saying it very clearly, none of the money was spent other than for the performance of the president’s office. Earlier in the interview, Higgins said that the allowance is “not an allowance for me, it’s an allowance to whoever is the president at any time”. “I will next year, if I’m back in office, make proposals to maybe, for example … I don’t think we tell people sufficiently what we do in the Áras in terms of the amount of sheer business and activity we do,” Higgins said. He suggested that the Áras could have an annual report, which has a statement on the allowance of the presidency. At the end of the interview, Higgins was asked what he wants his legacy as the President of Ireland to be. “It’s about inclusion, it’s about equality,” he said. “I would say this that’s important, and I’m saying it about my own candidature. I don’t believe in running down anyone else’s candidature. Email “Michael D Higgins gives his first TV interview of the campaign on the Ireland AM couch”. Feedback on “Michael D Higgins gives his first TV interview of the campaign on the Ireland AM couch”.